Fifty years ago, on Oct. 2, 1968, Cardinals ace Bob Gibson stood on the mound at Busch Stadium in St. Louis for Game 1 of the World Series. The 6-foot-2 Gibson glared toward the plate, his jaw dripping with sweat, his cap pulled low over his face. Batters stood in against Gibson with trepidation, facing an arsenal that included a sharp curve, a devastating slider and a high-90s fastball that often came in high and tight. All of baseball had been waiting to see this day’s pitching matchup: the nearly unhittable Gibson vs. 31-game winner Denny McLain of the Detroit Tigers. A record crowd of nearly 55,000 fans came to see what promised to be a pitcher’s duel for the ages. But 1968 was about much more than baseball. Both Martin Luther King Jr. and Robert Kennedy had been shot dead by assassins’ bullets. Arthur Ashe became the first black player to win a major tennis title. Black athletes debated boycotting the Summer Olympics, and John Carlos and Tommie Smith raised their fists in protest after winning Olympic medals in Mexico City. For Gibson, a black man raised during the Jim Crow era, the events of that summer ignited a fire that burned inside of him. And he channeled its heat into every pitch he threw. On April 4, 1968, when King was gunned down in Memphis, Tennessee, virtually every sports league except baseball stopped play in honor of the slain civil rights leader. Baseball commissioner William Eckert, rather than postpone Opening Day, left it up to the individual teams to decide how they would acknowledge King. Gibson, along with other black players (most notably those on the Pittsburgh Pirates), made it clear he wouldn’t take the field. Only after the holdout did Eckert reschedule the start of the season for the day after King’s funeral. Two months after King’s murder, presidential hopeful Robert Kennedy was shot and killed just after winning the California Democratic primary. An enraged Gibson began pitching with a vengeance. The day after the shooting, he shut out the Houston Astros on three hits. Then he shut out the Atlanta Braves, the Cincinnati Reds, the Chicago Cubs and the Pittsburgh Pirates. This was war, and each pitch Gibson threw was a missile. Was it Kennedy’s assassination that spurred Gibson? It’s impossible to say. But Gibson himself said he pitched better angry. And although his teammates referred to him as affable and humorous, the opposition saw his anger and talent as pure intimidation. 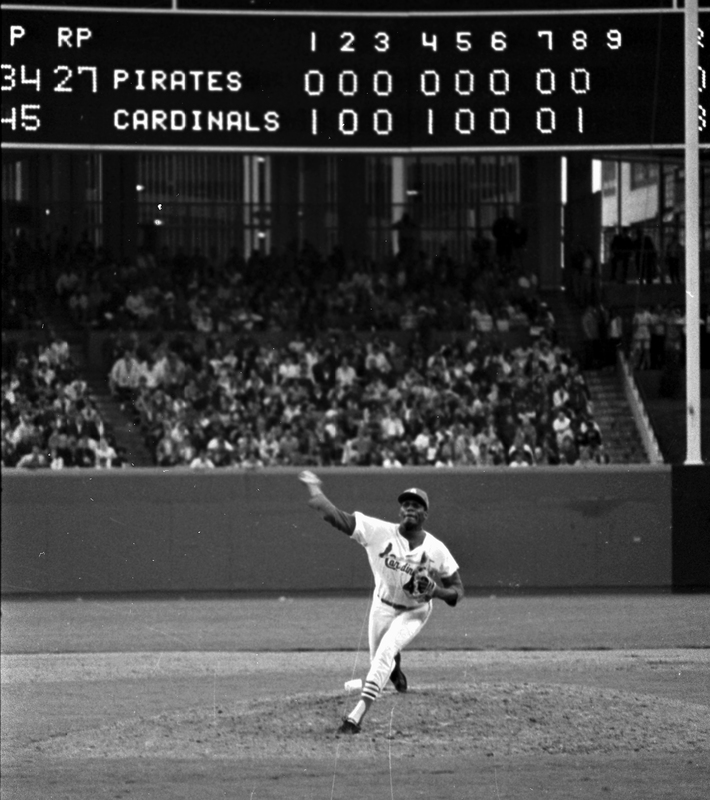 St. Louis Cardinals pitcher Bob Gibson strings out the zeroes on the opposition scoreboard (background) as he pitches a consecutive shutout against the Pittsburgh Pirates. Gibson extended his string of scoreless innings to 48 as the Cards blanked the Bucs 3-0 in the first game of a two-night doubleheader. Gibson, who gave up only four hits en route to his fifth straight victory and ninth win of the season, doubled in the fourth inning to score the Cards’ second run on a double by Lou Brock. With his shutout of the Pirates on June 26, Gibson had strung together 47 consecutive scoreless innings. In his next start, against the Dodgers in Los Angeles, he faced Don Drysdale, who weeks earlier had set the all-time regular season mark at 58 2/3. Gibson’s chase of Drysdale ended abruptly in the first inning when Gibson threw a wild pitch that nicked off backup catcher Johnny Edwards’ glove, scoring Len Gabrielson from third. Gibson went on to win the game, 5-1, but the streak was over. In the clubhouse after the game, Gibson’s comments to the press spoke volumes about his loose presence in the clubhouse — and the angst that boiled inside of him. “Did you throw a spitter?” the left fielder, Lou Brock, said, cracking up the players and reporters alike. But the press continued to prod Gibson. Did you feel any pressure trying to maintain the scoreless streak? Growing up in the Logan Fontenelle housing project in Omaha, Nebraska, Gibson learned early on that racism came from all directions. In his autobiography, he recalls how, being a black kid, he couldn’t play on the baseball team at Omaha Technical High School. Blocked from his chosen sport, he took up basketball. But even after proving his worth on the court, and having every reason to believe he’d be admitted to Indiana University, he discovered that the college had already met its quota of black players: one. When Creighton University, the local Jesuit school, offered him a basketball scholarship — the first it had ever given to a black student — Gibson took it. He returned the favor by breaking every Creighton scoring record before graduating in 1957. 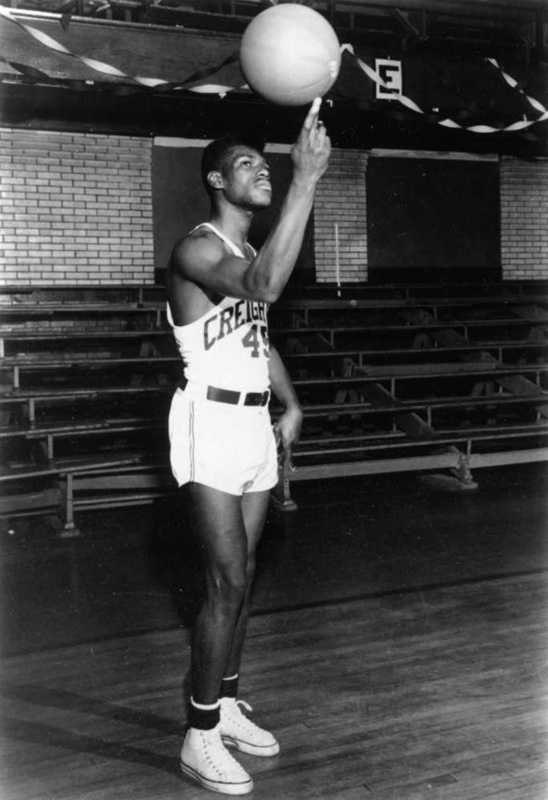 Bob Gibson spins the basketball on his finger while wearing his Creighton uniform. Gibson’s father died before he was born. Josh, the eldest of the family’s seven children, became a surrogate father, training Bob as an athlete and, to some extent, as a person. Josh himself had been no stranger to bigotry. Even with a master’s degree in history, he’d been denied the opportunity to become a high school teacher in Omaha — and thus developed a justified chip on his shoulder. By the time he coached his younger brother’s all-black American Legion Baseball team, which traveled to small towns throughout the Midwest, a hardened Josh wouldn’t stand for mistreatment from anyone. Coming out of college, Gibson was still unsure which sport to pursue, and he signed with the Harlem Globetrotters and the St. Louis Cardinals. He finally chose baseball and broke into the majors in 1959, playing for manager Solly Hemus. To “motivate” his black players, the bigoted Hemus freely hurled racial epithets at them, and demeaned Gibson’s intellect by telling his pitcher not to bother attending pregame strategy meetings. In 1968 — despite playing for a new manager, the broad-minded Red Schoendienst — Gibson hadn’t forgotten the abuse he’d been dealt. He didn’t speak out in the way Ali or Brown did, but he contributed to the civil rights struggle the best way he could: by excelling on the baseball diamond. What Gibson helped create was an atmosphere where players openly shared grievances. It didn’t hurt that the team was well-integrated: There were six nonwhite players in its starting lineup (including Gibson); the rest of the league was nearly three-quarters white. Plus, the Cardinals’ core players had been together since the early 1960s, when baseball teams, in Florida for spring training, were beginning to defy Jim Crow laws that called for segregated housing. In 1962, Cardinals owner Gussie Busch leased a motel in St. Petersburg to house his entire team under one roof. As a result, Cardinals players of all races dined together, socialized together and got to know each other’s families. By the time Gibson stood on the mound at Busch Stadium in Game 1 of the ’68 World Series, he was so on top of his game that the Tigers didn’t stand a chance — despite a lineup loaded with great hitters. Gibson struck out six of the first seven Tigers and struck out the side twice. He had a 4-0 lead when he took the mound in the ninth inning — familiar territory for a workhorse who’d thrown 28 complete games that season. After giving up a single to Tigers shortstop Mickey Stanley to start the inning, Gibson faced the heart of the order: Al Kaline, Norm Cash and Willie Horton — a murderer’s row with 71 homers during the regular season. After going two-and-two on Kaline, he struck him out on a fastball. Seconds later, a thunderous cheer rang out from the crowd. McCarver stepped in front of the plate and pointed with his gloved hand at something behind Gibson’s head. Gibson turned and looked for a second, and then yelled for McCarver to throw him the ball. What he didn’t see, or care to acknowledge, was the sign on the scoreboard announcing that he’d just struck out his 15th batter, tying Sandy Koufax’s World Series record. Gibson took the ball and got back to business, striking out Cash on a two-two slider and freezing Horton with a picture-perfect curve that broke along the inside corner for strike three. The game was over, and Gibson’s 17-strikeout masterpiece was inked into the record books. 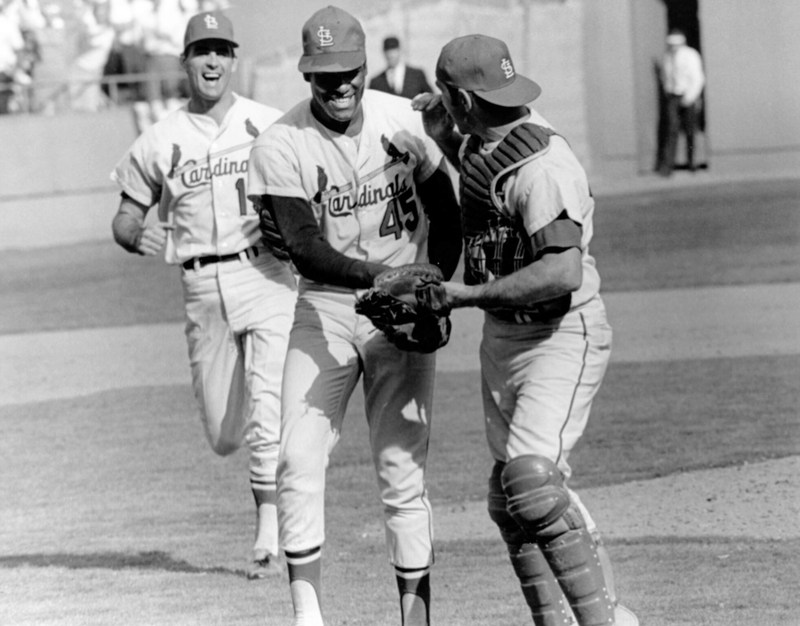 St. Louis Cardinals pitcher Bob Gibson (center) is congratulated by catcher Tim McCarver (right) during the 1968 World Series against the Detroit Tigers. Gibson struck out 17 batters in the game. The Cardinals, however, would wind up losing the Series in seven games. Gibson won the first and fourth but lost the decisive seventh on a rare misplay by Flood, a Gold Glove center fielder. Still, his 1968 season is talked about as perhaps the greatest of the modern era. In 1975, Gibson retired after 17 years in the big leagues. He walked away with a 251-174 record, 3,117 strikeouts and a 2.91 ERA. He won the Cy Young and MVP awards in 1968, took home another Cy Young in 1970 and was elected to the Hall of Fame in 1981. He now lives in Omaha and didn’t respond to interview requests. “When you’re there on the mound, it’s the loneliest place in the world,” Spivey said. “You have the perfect opportunity to be great or to be a flop. In a World Series game, the whole world is watching you to see which way you go. You’re going to be great or you’re going to be a flop. John Florio and Ouisie Shapiro are the authors of 'One Nation Under Baseball: How the 1960s Collided with the National Pastime,' and 'One Punch from the Promised Land: Leon Spinks, Michael Spinks, and the Myth of the Heavyweight Title.' Their young adult book, 'War in the Ring: Joe Louis, Max Schmeling, and the Fight Between America and Hitler,' is due out in 2019.